The NFL season is officially fewer than 40 days away, which means training camps have begun. There will be plenty of story lines and position battles that emerge from camps but today we’re going to take some time to highlight one rookie (in most cases just one at least, re: Chargers) for each team that you should keep your eye on. Not all of these rookies were first round picks during May’s draft, but all of them have the chance to emerge right from the start as an impact player for their respective team. 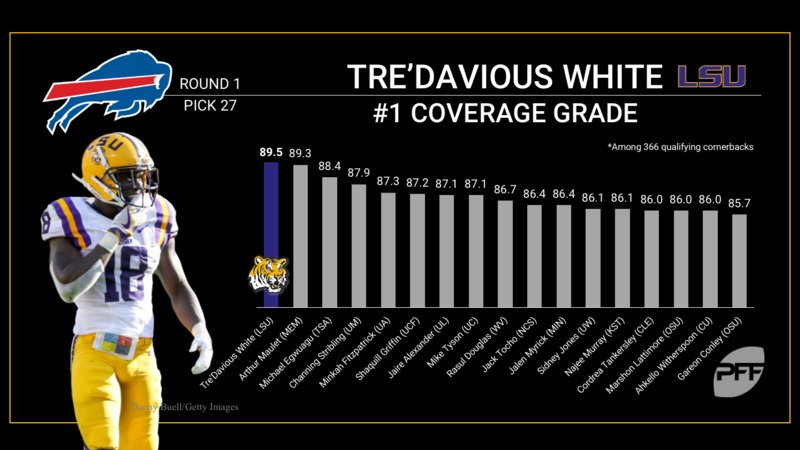 Tre’Davious White – White’s 12 pass breakups were tied for third in the nation last season and he also had two interceptions. The four-year starter from LSU is capable of playing both on the outside and in the slot and will play a heavy role in the Bills defense this season after they lost Stephon Gilmore in free agency. Raekwon McMillan – McMillan ranked seventh among 348 qualified FBS linebackers last season with an 87.9 run defense grade. McMillan was already seeing first-team reps at middle linebacker late last week and could very well be starting there when Miami takes the field in Week 1. ArDarius Stewart – Stewart’s 50.0 catch rate on passes that traveled at least 20 yards in the air last season ranked 20th out of 252 qualified receivers and his 71.9 run blocking grade ranked 21st in the nation. His health will be something to keep an eye on as two separate surgeries – one on this thumb, another on his groin – cost him all of OTA’s and minicamp. Antonio Garcia – Garcia ranked fifth among 285 qualified tackles last season with a 98.9 pass block efficiency rating (PBE measures pressure allowed on a per-snap basis, weighting towards sacks) after he allowed just seven total pressures – with none of them being sacks – on 477 pass blocking attempts. Jordan Willis – Willis ranked fourth among 356 qualified edge defenders last season with a 90.5 overall grade and his 77 total pressures were third most among the group. With a strong camp he could earn significant playing time opposite Carlos Dunlap right out of the gate. DeShone Kizer – Kizer led 133 FBS quarterbacks last season with a 154.7 passer rating on throws off of play action and his average of 13.4 YPA ranked second. There are already rumblings coming out of Cleveland that Kizer has the chance to beat out incumbent starter Cody Kessler for the Browns Week 1 starting gig. Tim Williams – Williams averaged a pressure once every 4.9 pass-rushing attempts in 2016 and his 16.2 pass-rushing productivity (PRP measures pressure generated on a per-snap basis, weighting towards sacks) ranked eighth among all edge defenders. Williams should play himself into a role opposite Terrell Suggs on passing downs but if he can show some ability against the run in camp, we could see him on the field a lot. JuJu Smith-Schuster – Smith-Schuster ranked 58th among 124 draft-eligible receivers last season with an average of 2.07 yards per route run and in 2015 he ranked sixth among the group with an average of 3.48 yards per route run. Lacking a true receiving threat at tight end, strong play from Smith-Schuster would give Pittsburgh the opportunity to stretch the field with more four-receiver sets. Quincy Wilson – Wilson never allowed more than 25 catches in a season at Florida and the 29.9 passer rating opposing quarterbacks had when throwing into his coverage last season was the third lowest among Power 5 cornerbacks. Will he be able to hold off Rashaan Melvin and claim a starting spot opposite Vontae Davis? Dawuane Smoot – Smoot’s 53 total pressures last season ranked third among draft-eligible Big Ten defenders. With a strong camp he’s got a shot at earning significant playing time alongside Calais Campbell and Malik Jackson as Jacksonville figures out their edge rotation. Deshaun Watson – Watson’s 76.1 adjusted completion percentage in 2016 ranked third among 43 draft-eligible quarterbacks, and that was actually down a bit from 2015 when he ranked second among the group at 77.3 percent. At some point this season Watson is going to be named the Texans starting quarterback, it’s just a matter of when. 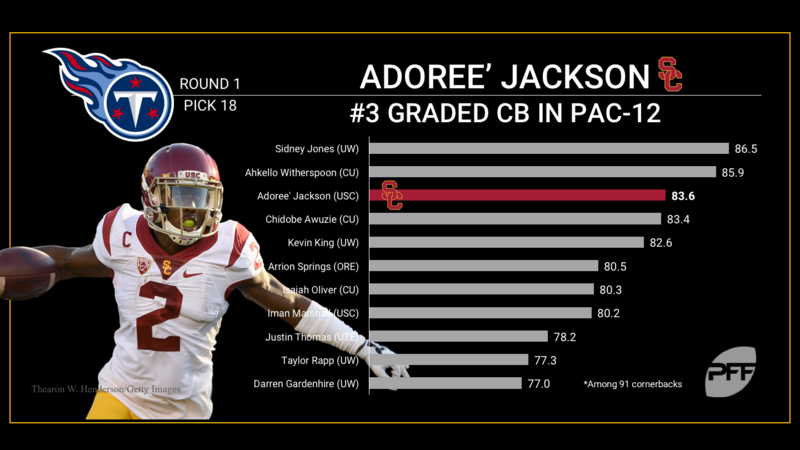 Adoree Jackson – Over the past three seasons at USC, Jackson scored nine combined touchdowns on defense and special teams (along with six more on 39 receptions on offense) and he tied for being PFF’s highest-graded returner in the FBS last season. Jackson should have a healthy role on defense right from the start and it will be exciting to see how the Titans use him on special teams. Garett Bolles – Bolles had the second-highest percentage of positively graded run blocks among tackles in the draft class in 2016 but he also had his inconsistencies in pass protection, he ranked 41st among the group with a PBE of 96.4. 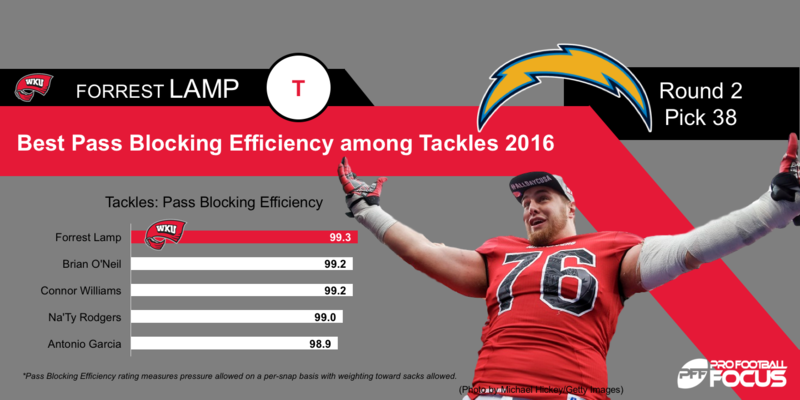 Forrest Lamp and Dan Feeney – Lamp was PFF’s highest graded FBS tackle in 2016 and over the last three seasons he allowed just 31 total pressures on 1,620 pass blocking attempts; Feeney allowed just 25 total pressures on 1,239 pass block attempts in the last three years as well. As the Chargers overhaul their offensive line, there’s a great chance that we’ll see both rookies starting on the interior of the offensive line. Patrick Mahomes – Mahomes led this quarterback draft class with 1,281 yards on throws that traveled at least 20 yards in the air and his 82.9 accuracy percentage from a clean pocket ranked second. The Chiefs gave up a lot to move up and take Mahomes, a strong training camp turns the pressure up even higher on Alex Smith to start the season. Eddie Vanderdoes – Vanderdoes’ 85.4 overall grade from 2016 ranked 26th out of 540 defensive interior players. He was the 10th highest rated recruit coming out of high school by ESPN and in 2014 he ranked 13th among 115 defensive interior players in this draft class with an 8.2 run stop percentage (the percentage of a players run defense snaps where he was responsible for a stop). He missed all but one game in 2015 with a knee injury. Chidobe Awuzie – Awuzie led all cornerbacks with 41 stops in 2015 and he also led cornerbacks with 29 total pressures over the past two seasons. ESPN’s Todd Archer wrote about how Awuzie is learning a variety of positions in the secondary to start training camp, he should get plenty of opportunity to show off his vast skillset. Awuzie and fellow NFC East rookie CB Rasul Douglas will both look to make significant contributions to their respective teams this season. 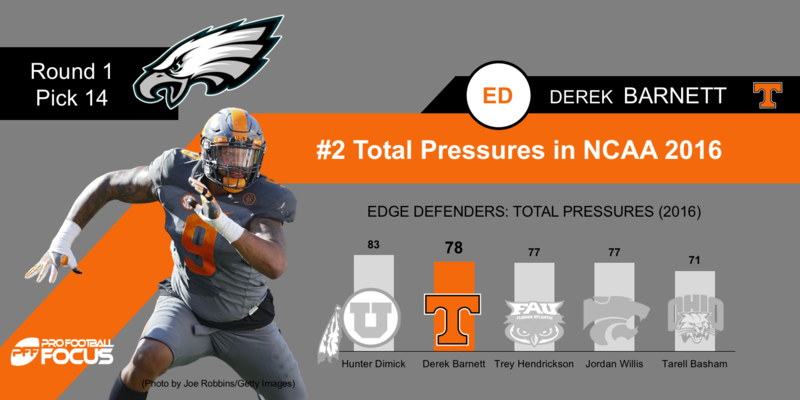 Derek Barnett – Barnett was our second highest FBS graded edge defender last season and his 91.3 pass rushing grade ranked first. Barnett ranked third among Power 5 edge defenders who saw at least 115 pass rush attempts last season with a 16.9 PRP. If he produces anywhere close to that Philadelphia may possess the best defensive line in the league. Evan Engram – Engram led all tight ends last season with an average of 2.59 yards per route run. He and Eli developing a rapport early would give New York an added dimension their offense to go with Odell Beckham and company. Samaje Perine – Perine ranked fifth among all FBS running backs in 2014 with a 100.4 elusive rating (uses missed tackles missed and yards gained after contact to determine a runners success independent of the blocking in front of him) but his performance has fallen a bit from that peak in the last two seasons. With a strong camp he could challenge Rob Kelley for some early-down work. Mitchell Trubisky – Trubisky ranked fifth among Power 5 quarterbacks with a 66.7 adjusted completion percentage on throws coming under pressure. The Bears paid a heavy sum to move up to take Trubisky second overall, shortly after they paid Mike Glennon a bunch of money to be their starting quarterback. A strong camp from Trubisky could give us a bit of a quarterback controversy in Chicago. Kenny Golladay – Golladay ranked 17th among 510 FBS receivers last season with an 87.3 overall grade and he dropped just five of 165 catchable passes over the last two seasons. Following Golden Tate and Marvin Jones, Golladay has a strong chance of emerging as Detroit’s number three receiver. Kevin King – King allowed just three catches while defending 17 go routes last season and he gave up just one touchdown over his last 28 college games. Packers corners were routinely roasted last season, much attention will be paid to whether or not King can shore that unit up. Bucky Hodges – Hodges led all tight ends with an 85.0 receiving grade as a redshirt freshman in 2014. There are snaps to be had from the tight end position in Minnesota and Hodges has an opportunity to prove that they’ll get quality ones from a sixth-round pick. O.J. 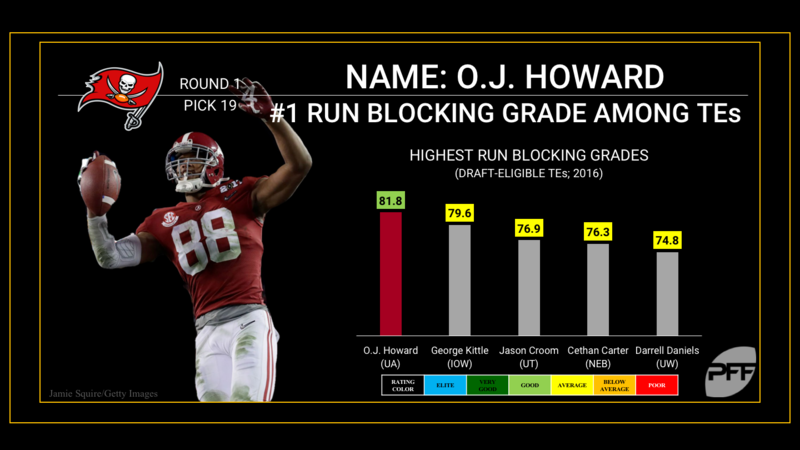 Howard – Our highest graded run-blocking tight end in 2016, if Howard can develop an early rapport with Jameis Winston, he and Cameron Brate (84.1 overall grade last season, seventh among tight ends) could form one of the most dynamic tight end duos in the league. Takk McKinley – McKinley ranked seventh among 356 edge defenders last season with an 89.0 overall grade; his health will be something to monitor throughout camp as he’s been limited as he comes off shoulder surgery. Curtis Samuel – Samuel played all over the field in 2016, lining up in the slot 425 times and in the backfield 220 times. He ranked second among running backs with an average of 2.76 yards per route run and his 98 targets were 32 more than any other running back in a Power 5 conference. How Carolina uses him – along with Christian McCaffrey – will be something to monitor all August. Ryan Ramczyk – Ramczyk was our highest graded offensive tackle last season in terms of run blocking but he had a good-not-spectacular season in pass protection, finishing 17th among Power 5 tackles with a 97.5 PBE. With Terron Armstead out for an extended period of time, the Saints are preparing to rely on Ramczyk to protect Drew Brees’ blindside, his development there is something to keep an eye on. Reuben Foster – Foster led all linebackers with a 95.2 overall grade last season and his 16.3 run stop percentage led all linebackers who were in on at least 150 run defense snaps. Now that he has been medically cleared to play, it’ll be interesting to see just how big of a steal the 49ers got with the 31st overall pick. Budda Baker – Baker was sixth among safeties last season with an 87.4 overall grade and his 32 defensive stops tied for second most in the draft class. The Cardinals will have to find a way to replace Tony Jefferson’s production – especially at stopping the run – and Baker could go a long way towards that. 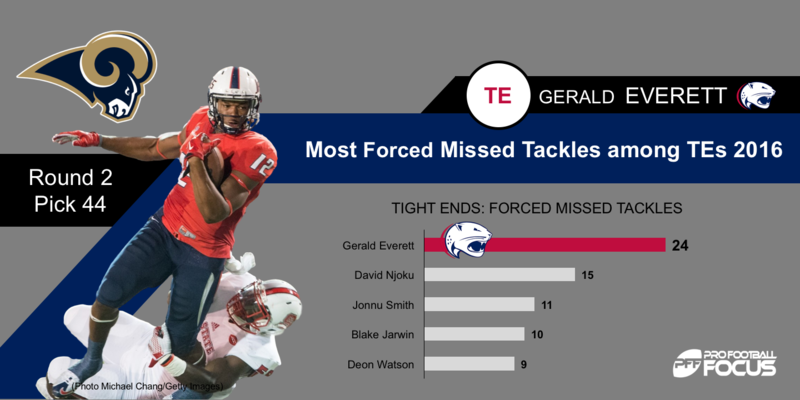 Gerald Everett – Everett led tight ends in forced missed tackles in both 2015 and 2016, his 24 last season were nine more than any other tight end. Jared Goff struggled as a rookie last season but the presence of Everett, Cooper Kupp and head coach Sean McVay should go a long ways towards Goff making positive strides in year two. Shaquill Griffin – Griffin limited six wide receiver screens caught in his coverage last season to just 19 total yards while allowing just two catches (and snagging two interceptions) on 19 go routes thrown into his coverage. Seattle has been looking for a reliable option to put opposite Richard Sherman and Griffin could very well emerge as that guy.